The Sintesi concept by Pininfarina features a single futuristic LED headlight powered by Osram Opto Semiconductors LEDs (light emitting diodes) which emphasised its car-of-the-future pretensions. The future is now based on Osram's LED headlight sensation that took the Geneva Motor Show by storm. 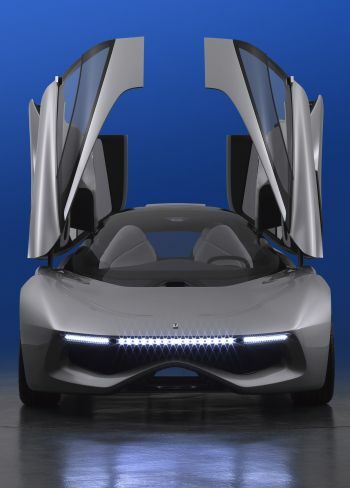 The Sintesi concept by Pininfarina features a single futuristic LED headlight powered by Osram Opto Semiconductors LEDs (light emitting diodes). The ultramodern headlight design emphasised Sintesi's car-of-the-future concept. Instead of two standard separate headlights, the Sintesi headlight was comprised of 16 Osram Ostar headlamp LEDs that formed a continuous, narrow strip of light. The ultra-bright and efficient LED-powered headlight is one of several LED packages illuminating this concept car. Pininfarina also chose Osram LEDs for the Sintesi's daytime running lights, turn lights and taillight clusters. In addition, the distinctive interior lighting was highlighted with Osram Linearlight Flex LED modules. "When it comes to automotive lighting and highly demanding projects, we have the in-house expertise and portfolio to assist in the design and development of any automotive application," said Peter Knittl, Head of Automotive LED Marketing at Osram Opto Semiconductors. "Headlights and all the ancillary lighting functions can be achieved enabling a high degree of creativity while still being suitable for series production and allowing designers total freedom." The Osram Ostar Headlamp LED technology platform allows for infinite options in the design and manufacture of traditional headlights. By the end of 2008, Osram Opto Semiconductors plans to launch a number of different chip configurations in addition to the current 5-chip platform, enhancing their portfolio and delivering expanded design flexibility. "The latest concept cars are just the beginning. Our high-power OSTAR Headlamp LED technology platform opens up so many options for automotive lighting design in addition to traditional headlights and LED strips," added Rudiger Muller, CEO of Osram Opto Semiconductors. Osram is part of the Industry sector of Siemens and one of the world's two leading lighting manufacturers. The subsidiary Osram Opto Semiconductors GmbH (Regensburg, Germany) offers its customers solutions based on semiconductor technology for lighting, sensor and visualization applications. The company employs more than 4,000 people worldwide and operates sites in Regensburg (Germany), Santa Clara (USA) and Penang (Malaysia). Sales for the fiscal year ending September 2007 totalled more than 520 million euros.